The Kings practiced for about 50 minutes Monday in Raleigh, N.C. following an off day Sunday. 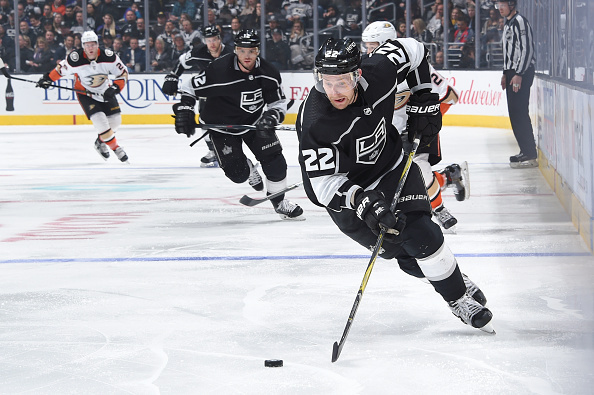 Coach John Stevens addressed several topics including what he thought of the NHL’s decision to suspend forward Dustin Brown one game, froward Trevor Lewis’ status and not having both Lewis and Brown in the lineup for Tuesday’s game at the Carolina Hurricanes. Lewis was injured Friday at the Florida Panthers and returned to Los Angeles on Saturday. His shoulder and back area slammed into the boards after a check from Jared McCann. Big change on the right side, so we’ve like our guys down the middle and the left side in terms of how they work and function together and a lot of times the lines are pairs but I think our guys have had the ability to move around a little bit. We’ve had guys that have the ability play wing and center, which I think has helped us. (Mitchell) has been one guy that’s been really versatile for us – plays wing and center. Michael (Amadio’s) done it. (Gaborik) has played left and right. We have options but I honestly believe it’s an opportunity because if you look the other night in Tampa Bay some of those kids took a really good advantage of an opportunity to maybe play a little bit more with what was going on and (Lewis) going out and (Brown) getting kicked out and really made the most of it. I think a lot of times you’re pleasantly surprised with opportunities when it’s taken the right way and we’re going to need that. Carolina plays a good team game and they roll four lines, they play with a lot of pace and we’re going to have to do the same. I always respect the league’s decision but I don’t agree with it. Like when I looked at it I thought he was totally planted and leaning with the shoulder. I didn’t go through it frame-by-frame like they probably did. I’m sure there’s a lot of things they take into account but just based on the fact that he didn’t really veer his leg one way or the other. I thought he was trying to use his shoulder and the way he (inaudible) but again we’re going to respect the decision. I think the league does a good job of that stuff being very thorough and we’ll take the suspension, he’ll sit out the game and we’ll get back to work. We just have to figure out the right side to be honest with you and I think the right side has been in flux for us a lot. wW’ve moved guys around, a lot of times it has been the right side but a guy like (Kopitar) you can move people in and out of there, you can move him around, (Kopitar) is like Drew, it doesn’t matter who you put with him, he makes them better. Tyler’s played with (Shore), (Kempe) and (Kopitar) as well. (Brodzinski) actually he has the ability to move around and like I said, I think you have options on right wing with Amadio, with Gaborik, with Mitchell so I think even Iafallo could play the right if you needed him to so we’re going to take the day to think about it, but again I think middle-left looks like it has some continuity there and it just may be a matter of rolling the right side until we figure out what works, but we’ll put guys in to give them the opportunity. We could. (Brown) is out for one game. We have an extra body here, we have an extra defenseman. We also have the option of dressing 11 forwards and seven defensemen and that’s something we’ve considered as well so we do have an option in terms of a roster spot and cap space but the fact that (Brown) is out for one game, we think we have the people here that can put a lineup together to give us a chance to win until (Brown) comes back. The only thing I can tell you is that he’s seeing our doctors and I think he’s getting further tests done today just to be really thorough with the examination and then we should have a better idea. He’s pretty stiff and sore right now. He feels good, is that cognitively, is that the right term? [Reporter: Yep] but his body is pretty stiff and sore. We’ll get a really good evaluation from our people today and then should have a better idea of where he’s at. The line (he was on) was really good. I thought they were very disruptive on the forecheck and they really worked hard to get on top of pucks and then when they had pucks they were thinking about shooting pucks and going to the net. And I look at that group, even the goal they scored on the rush, I mean there was no question the middle guy was going to go to the net and he was going to arrive at the net and it kind of opened up space, and I think when guys are predictable to each other because they’re thinking that way, it makes you faster and it creates openings and they’ve taken advantage of it so their team game has been real good. It has been good to see. I think we as a staff are really starting to trust him and we think he can score. He has good speed and quickness. He’s got a great shot and he has a really quick release. He has scored at every level he’s been at and was a 20-goal scorer every year in college, which is hard to do so we’re happy to see him create some offense for us. We thought about it but they may end up playing a little bit, but maybe we’ll move them around as well. (Brodzinski) had some good shifts with (Kopitar) last (game) and he has played with Kempe before, so I think if he’s playing the game he needs to play. I don’t think he needs to stay where he was. We can move him around. He just needs to keep playing the same. He needs to think about getting in on the forecheck. He needs to think about shooting the puck, he needs to think about getting to scoring areas but at the same time be a responsible guy and he has been that. I think at the beginning of the year Jonny was trying hard to do all the right things but he was maybe playing, I don’t think safe’s the right word but cautious? But we want him to be the player that he is and we want him to play with confidence, have the courage to make plays at the right times on the ice and play a real, good solid team game and I think his game has really progressed. He’s a lot less hesitant, a lot more ‘just let the game react’ to what he’s seeing and be the player that we think he should be. I actually thought there was a stretch of games here lately where he’s had a lot of chances, he just needs to start finishing those chances. I think sometimes you score and get chances or don’t score and you start thinking of it a little bit too much but I do like the fact that he has been getting chances. I think the key with an offensive player, and Tyler is not just an offensive player, he’s a good well-rounded player. We use him on killing penalties (last game), which he has done lots of with guys being out (Lewis) being out and (Brown) being out. He’s a good penalty killer. He plays the game the right way. He gets the puck in areas where you can take advantage, I’d just like to see him bury some chances. Tanner too, to me as well – his game is coming. He’s a real worker and he’s on top of pucks. When you see him physically involved in puck battles, it usually leads to good things in his game. I actually think his game is trending in the right direction but I think both of those kids … I think they need to focus on the process of playing the game the right way and their skillsets will take over. I think they’ve done that especially as of late but there’s no question if they just bear down a little bit around the net, production out of those two guys would be a big help to the hockey team.